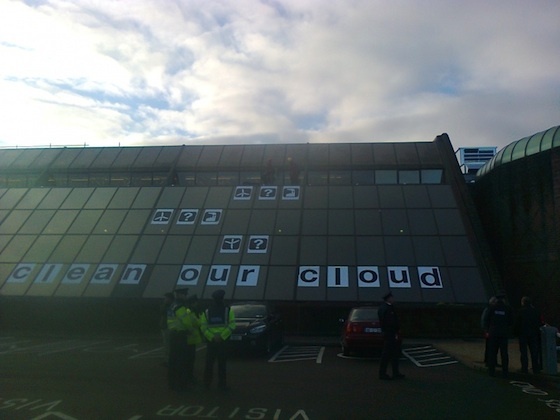 As documented by Corkipedia, four Greenpeace activists climbed to the roof of Apple's offices in Cork, Ireland today, posting signage and distributing leaflets in an attempt to push Apple to adopt cleaner energy sources for its data centers. The protest, which lasted approximately an hour, came a day after Greenpeace blasted Apple, Amazon, and Microsoft for relying heavily on dirty coal power for their data centers. It appears, however, that Greenpeace's assessment of Apple's energy use was based on flawed assumptions, and Apple stands by its claims that its new data center in Maiden, North Carolina and a forthcoming one in Prineville, Oregon will be among the cleanest in the world. Greenpeace estimated that the Maiden facility would require 100 megawatts of power at peak capacity, claiming that Apple's proposed solar and fuel cell facilities at the plant would provide only 10% of the center's energy needs. The group's report also appears to assume that the Prineville facility will run on dirty power sources, and those two assumptions were combined to give Apple a low "clean energy index" score of 15.3% and estimate Apple's share of data center power usage derived from coal at an industry-high 55%. Apple quickly responded to the Greenpeace report, issuing statements to several media outlets claiming that the Maiden data center requires only 20 megawatts of power at peak capacity and that the renewable energy sources being built at the site will provide at least 60% of the center's power needs. In addition, Apple notes that the Prineville data center is planned to run on 100% renewable energy. For its part, Greenpeace believes that Apple is continuing to obfuscate its energy numbers and release only those that make the company appear in a positive light. And so despite Apple's claims regarding significant efforts to minimize the impact of its data centers on the environment, Greenpeace believes that the company should be doing more to publicly lead the way toward further adoption of renewable energy sources. And this is why nobody cares about Greenpeace any longer: too fanatical and not rational. I used to kind of respect Greenpeace but over time they have proved to be complete idiots. Datacenters are green. Massive servers that replace thousands of servers that would be required otherwise... It's like mass transit. The thing itself uses a massive amount of juice, but the alternative is far worse. I suppose it's just short-sightedness on their part? For its part, Greenpeace believes that every company in the world is continuing to obfuscate its energy numbers and release only those that make the company appear in a positive light. But Apple's Irish offices are powered by Guinness. I feel like there are much more environmentally-damaging companies they could be protesting instead of Apple, which actually has an amazing record for a computer company.